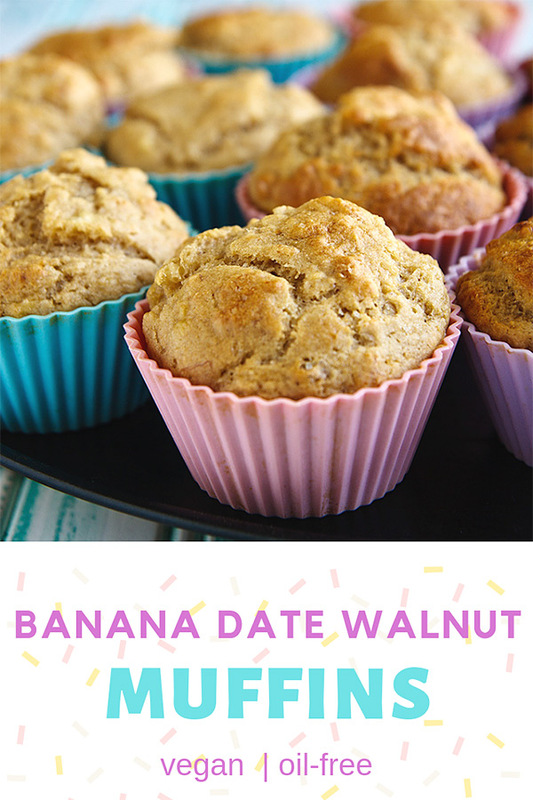 These vegan banana muffins are moist and delicious and filled with dates and walnuts. No one will suspect they have no added oil or butter. This morning I had a houseful of girls: my daughter E. had her friends J. and K. over to spend the night since today is a school holiday. I decided that instead of filling several breakfast orders (one loves grits, one likes cereal, one says she always eats bacon…) I’d make muffins. I took a look at some of the muffin recipes I could find online and in Vegan with a Vengeance for inspiration and then decided to just wing it! 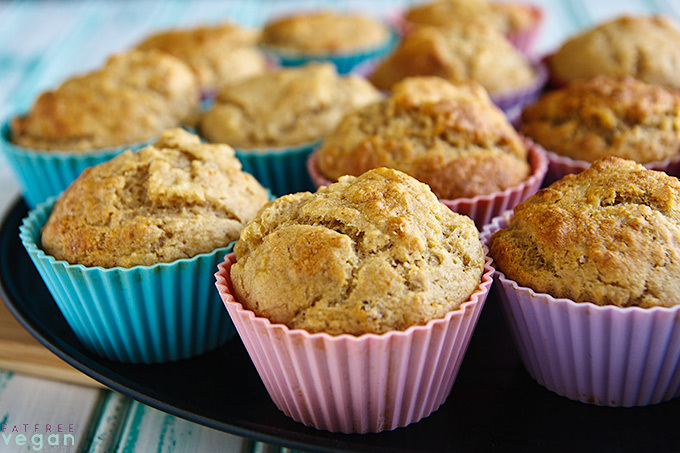 The result was these amazing, tender, fat-free vegan banana muffins. These came out very light and sweet; J. actually asked if I had any “regular” muffins because “these are too sweet.” You can probably reduce the sugar with no ill effects. Enjoy! October 2011 update: E and I just made this recipe again, and it’s as good as ever. It struck me now as being extremely sweet, so I recommend doing away with the agave nectar, which I’ve now marked as optional, or reducing the sugar to 1/3 cup unless you like your muffins super sweet. Give them a few minutes to cool off before eating; they’ll be more tender that way and you won’t burn the roof of your mouth! These are my all-time favorite muffins. Make them with or without the dates and nuts to change the calorie content. 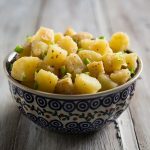 Without walnuts: 128 Calories (kcal); trace Total Fat; (2% calories from fat); 2g Protein; 31g Carbohydrate; 0mg Cholesterol; 171mg Sodium; 2g Fiber. I thought the amount of sugar called for in this recipe was excessive so I used naturally sweeter rice milk instead of soy, upped the dates to 1/2 a cup and took the 1/2 cup of sugar down to 2 tablespoons. The results were light and sweet. I made these muffins this morning for my family, and they absolutely loved it. THEY ARE ABSOLULTELY DELICIOUS. I omitted the 1/2 cup of sugar and the agave nectar and used some stevia instead because I thought they were going to be sweet enough already 🙂 you are amazing for posting up wonderful, healthy, easy recipes! I cook religiously from your website, so thank you!! I made these for breakfast and my family and I loved it! I used honey instead of agave nectar and didn't put dates. Definitely a thumbs up for this recipe! I want to make this but I have no applesauce (can’t make it to the store until Friday either). I need to make something with bananas, as I have a bunch of bananas that need to get made PRONTO (which irritates me, becuase I just bought them two days ago from Costco). I thought about making a vegan banana bread I’ve done before, but it’s super fattening. Any ideas? Probably the easiest thing to do is just add 1/3 cup more banana. I think that should work, but you could also try using a gel made of flax and water; just mix 2 teaspoons ground flax seed with 1/3 cup of warm water and let it sit to thicken. It just now dawned on me to make applesauce. So that’s what I have going right now. I had some apples that were getting mealy anyway, I was going to make apple pie like my husband has been begging me…this is probably a better choice. If I ever find myself applesauce-less again I’ll probably try the flax route. Oh, I should add. I’ve made this recipe a half dozen times, exactly as posted, and it came out perfect every time. I thought the amount of sugar was just fine. In place of the white flour I used whole wheat pastry flour. For the whole wheat flour I used white whole wheat. I used 1/2 cup applesauce and used date sugar, but no agave nectar. I used pecans instead of walnuts. Just wondering, can you use 1 3/4 C white whole wheat flour instead for all the flour called for? Yes. The white flour just makes them a little fluffier. You may need to add a little bit more liquid (like a tablespoon) if you use all whole wheat flour. Delicious! I’m not sure how long dates can be kept in the fridge before they go bad, so I used raisins instead, just to be on the safe side. I made other changes: I used all white whole wheat flour and no sugar at all (but increased the agave nectar to 4 tbsp.). I love how quick & easy most of your muffin recipes are. We would like to try your recipe with agave nectar instead of sugar. I would think it would be best to decrease the soymilk. How much soymilk would you suggest? I just made these using this variation, and the batter was a bit on the dry side. I added 2 tbs more soy milk to get the perfect consistency. I happened to have dried cherries, so I added a few of those too, and to make it more of a cake, I added a dark chocolate mocha glaze after they were cooled down. So yummy! Thanks for (yet another) a wonderful recipe. I made this recipe one morning for breakfast and it was wonderful. I did back off a bit on the sugar, but all the same, it is a keeper. Later that day my husband was making us smoothies and we had to guess the ingredients (a fun game). We got them all with exception of the last one…a banana-date-nut muffin from breakfast. It turned out to be an excellent smoothie! I’ve made these twice since Christmas and they’re delicious! I’d run out of whole wheat flour by the time I made the second batch, so I used whole wheat pastry flour exclusively (I can’t get white whole wheat flour here). And since I only had 1 TBSP of agave nectar left, I made up the difference with a TBSP of maple syrup. I also used the full amount of sugar called for (I used sucanat) rather than reducing it to 1/3 of a cup as I had the first time, and I sprinkled the tops of the muffins with a little demerara sugar just before putting them in the oven, for a little crunch and sprinkle! 🙂 We liked the second batch of muffins even better than the first one, and next time I make these I’ll use all maple syrup instead of agave nectar. We really enjoy these with our morning cup of Teeccino! Last night, I made the chai coconut breakfast cake, the blueberry breakfast bread and these banana muffins. They are all amazing! I loved that I had all the ingredients in my pantry already and didn’t have to buy anything for all three recipes to work. The three of them turned out perfectly. Great for freezing and grabbing on the go! These muffins were really tasty! I made a batch a few days ago and just put another batch into the oven now. I like to find different ways to use up bananas, plus I love dates. Even though I am not vegan, I still like to try different things. I did a few different things, like added 3/4 tsp. of cinnamon and a 1/4 tsp. of cloves. I added 2 tbsps. of maple syrup, as I don’t have agave nectar. The first batch of muffins I used honey. I also didn’t have whole wheat flour, so I used unbleached all purpose flour. I also don’t have vanilla soymilk, so I used skim milk with a tsp. of real vanilla. I did omit the walnuts, just to cut back on the fat a bit. Very lovely muffins. The first batch went fast! Thanks for posting your recipe. Looks great. Nice, simple, and delicious with coffee. 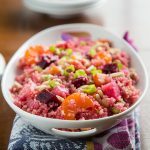 I wondered if I could make this any healthier and somehow omit the white flour altogether…what would happen if I used chickpea flour…or quinoa flour…or just stuck with all whole wheat flour? I would try using all whole wheat flour. I’m afraid chickpea flour would make it heavy, though a little quinoa flour might not hurt. Just made these and took them out of the oven 20-ish minutes ago. Major yum!! I didn’t change anything but I did have a bit of an oops with the baking powder…accidentally adding it to the banana mixture. I think it may have effected the rising of the muffins because they are a little short and extra moist. Doesn’t change their deliciousness though! The only other difference was using vanilla almond milk instead of soymilk. This recipe is definitely a keeper! Perfect balance of sweetness for me. Love the addition of dates. I love your blog and recipes and have great faith in them. However, this didn’t turn out quite right. They didn’t come out very sweet as comments say; in fact, I felt they needed a bit more sweetness. So next time I’ll increase either the sugar or agave nectar. Or maybe Splenda? Also, they weren’t light and fluffy. They were rather dense and soggy. What possibly could have gone wrong? I am looking forward to repeat this recipe, as I loved their banana flavor. I just need some suggestions for things to do (or mistakes to avoid) to improve the next batch! First of all – I love your site!! 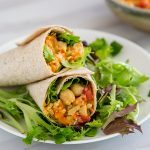 We have tried so many tasty new treats for the plant-based lifestyle that we live! Do you have any recommendations to use canned pumpkin instead of bananas? Perhaps some sort of pumpkin muffin? I have a good pumpkin bread that would make delicious muffins: https://blog.fatfreevegan.com/2006/12/pumpkin-spice-bread.html . Hope you enjoy it! Where did you get the cute heart shaped muffin cup? It’s been so long that I’ve forgotten, but probably some place on sale like Tuesday Morning. 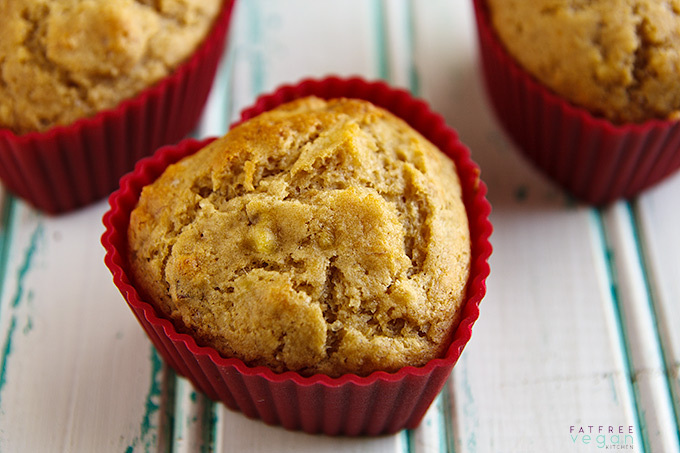 These muffins are super delicious and incredibly moist! I lessened the amount of sugar called for and i still thought they were incredible. But i do like a sweet muffin, so maybe next time i’ll add the amount of sugar called for. So delicious. Thank you!! Very good! Left out the agave but otherwise followed the recipe – even my carnivore (and picky!) husband loved them! Hi Nicole, sorry about the sticking! Yes, I almost always use silicone muffin cups (Wilton brand) to make these, and they make a huge difference. Next to them, non-stick metal is second best, and I’ve learned to never ever use paper liners with low-fat muffins because of the sticking. I need to add that to the instructions! Ive never had that happen, so I don’t know what went wrong. Did you change any ingredients? If everything else is the same, try using a little less liquid or smaller bananas. I’m making a bunch of food to take to my mother’s in a couple of weeks, as well as needing to make up as much food in advance of a week-long visit from my in-laws at the end of August as I can, and am wondering if anyone has ever tried freezing these and if so, how that went? I’m glad to hear they came out okay! I’ll bet they freeze well, too. They did indeed! If anything, they were even better (texture-wise) after freezing and thawing! Can’t wait to make more for my mom and in-laws, they’ll love these! I made these muffins today. I never go wrong with Susan’s recipes! These are delicious! I followed the recipe exactly except I used golden raisins instead of dates. Also, I omitted the nuts to have a lower fat muffin!! They are so moist and have a great flavor! My many vegan cookbooks have produced many a dud recipe but every time I come here the recipes never fail me! Thank you Susan Voisin! Do the Banana-Date-Walnut muffins really need a tablespoon of baking powder? It leaves a rather strong flavor. Dalia, all I can say is that this is the amount I always use, and they have never tasted of baking powder. I tried this out and I had to add about 3/4 cup of soy/almond milk. The amount specified in the recipe was not enough. The dough was not even remotely ready for a muffin recipe. I also found the muffins to be doughy when cooked. I kept them in the oven for 20 minutes as indicated. Perhaps I should have kept them a little longer? Otherwise, the taste was good. I substituted maple syrup for the sugar and did not include the agave at all. I also substituted gluten free flour for the white flour. Everything else I kept the same. This is regarding the banana pineapple version of this recipe on today’s newsletter. It has the option of sugar or a stevia blend. We don’t eat sugar anymore, or maltodextrin, which is in the stevia blend listed with the link. We sweeten recipes with dates blended in the vitamix… can you give me a rough idea of how many dates, blended to a puree, I should use to sweeten them? We don’t make things super sweet, but kinda sweet, if that makes sense. 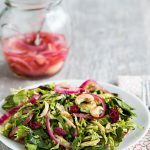 What I would do is start with about 1/3 cup of chopped dates–just pit them and cut into 3-4 chunks– and blend them with the recipe’s milk. You can actually taste the batter and see if it’s sweet enough, and if not, just add a few chopped dates right to the batter. According to a conversion table I use there are 225ml in one cup/8 ounces of liquid. Hope this helps. Just made these and they are delicious! 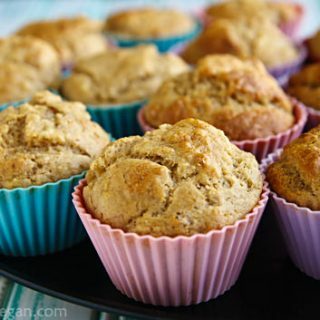 Best banana nut muffins I’ve made with no oil or dairy, hands down. I left out the dates because I didn’t have them and used unsweetened plain almond milk plus a little vanilla extract. Yum!! I made these exactly as described except that I had no walnuts and so substituted a scant 1/4 cup pecans that I had left over from another recipe. Perhaps it depends on the bananas and/or the applesauce, but these were perfect and not at all too sweet. I put them in a large tupperware container or bread box. They can be kept for about a day unrefrigerated. After that, refrigerate. Hi susan, I am trying to avoid white flour, could I maybe use rice flour or some more whole wheat four? I haven’t tried it with rice flour but all whole wheat flour works fine. You may need to increase the liquid by a tablespoon or two. I ended up using Granny Smith unsweetened apple sauce and they did not seem too sweet to me or my teenage son who really doesn’t like overly sweet things. So that may be another way to adjust it.